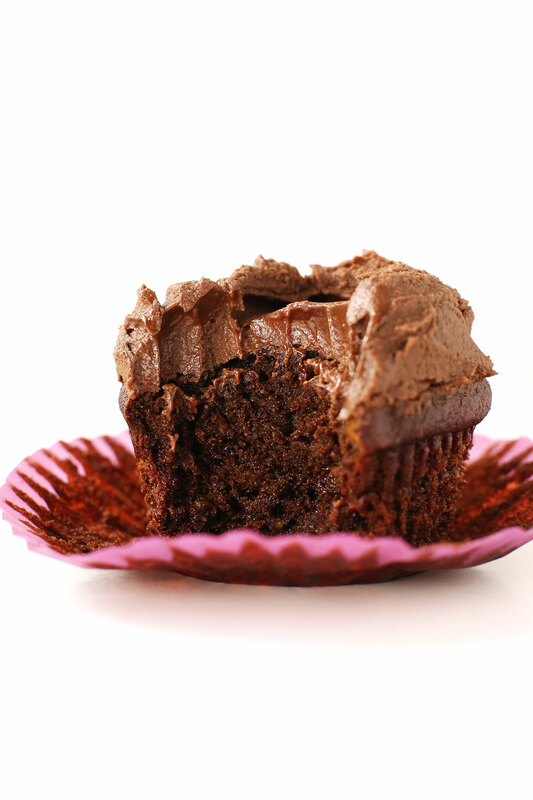 Can we just take a moment and revel in the deliciousness that is this chocolate cupcake? These cupcakes are my golden unicorn. I have been trying to make a vegan gluten free cupcake for quite some time now but couldn’t quite get it right. Finally, I prevailed. Maybe the vegan gluten-free baking heavens parted and granted me favor. Maybe it was the dancing I did while they were in the oven. Or maybe I finally crafted the perfect mix of carefully measured ingredients. Either way, I finally cracked the code and I couldn’t be more thrilled to share this recipe with you guys! The recipe may include more than my usual 10 ingredients by just a handful, but it only requires one bowl! And in case you haven’t noticed, no fancy equipment is required as I do all my baking with basic equipment, including a hand held mixer! We keep things old school around here. Plus, have you seen the counter space I’m working with? Where would I put a stand mixer?! Oy. I think the magic is in the beet puree and blend of gluten-free flours. 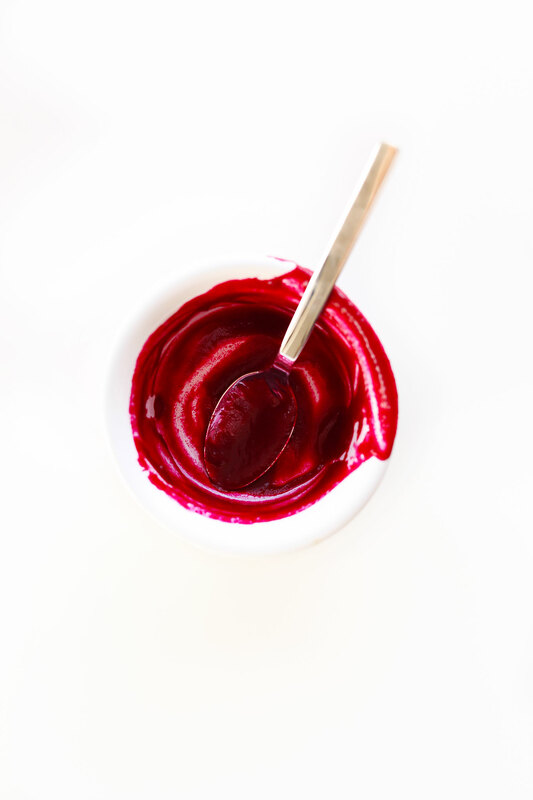 Beet puree not only adds an amazing magenta color to the batter (that disappears while baking), but extra moist texture and a ton of amazing nutrition benefits like vitamins A, B, C, magnesium, fiber and folate, just to name a few. As for the gluten free flours, I’ve found that gluten-free baking requires a mix of dry ingredients. In this recipe, that included a blend of cocoa powder, almond meal, gluten-free oat flour, and a gluten-free flour blend. I tested the recipe with two blends, so see the notes for details! In my experience, the blend makes all the difference. I was so pleased when I pulled these out of the oven and saw how fluffy and perfect they were, just like regular cupcakes. The only thing left to do was frost them with a thick, fudgy, chocolate ganache frosting! Whoa mama. This frosting (made in the same bowl!) requires just 4 ingredients and 30 minutes, and it’s insanely delicious. 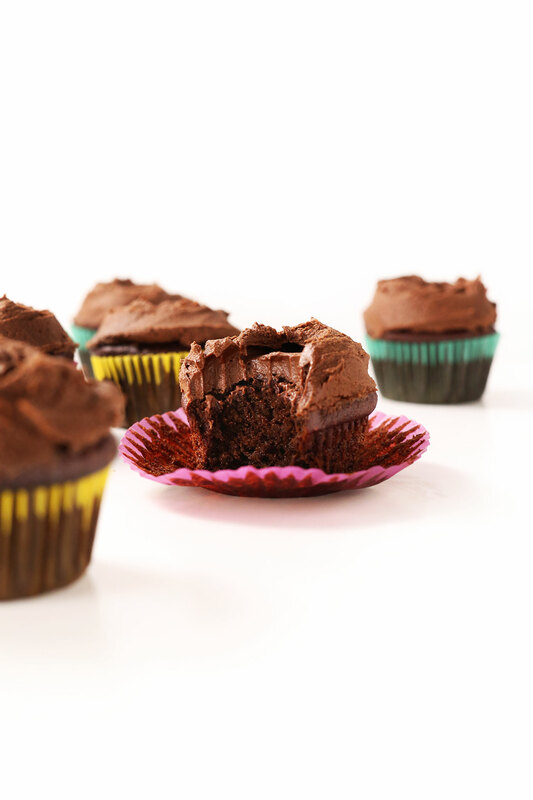 Super thick, fudgy, and fluffy atop these insanely moist, delicious cupcakes. I plan on frosting everything with this ganache from here on out. After sampling these myself I couldn’t believe my taste buds! I’d struck gold. So I tested them on some friends who all agreed they were incredible. I had a hard time naming them so I’ve decided to call them what they are: The Best Vegan Gluten-Free Chocolate Cupcakes! But seriously, more like the best cupcake I’ve ever had. Yep, I said it. If you try this recipe, you must let us know what you think! Leave a comment, rate it, share it on social media, or take a picture and tag it #minimalistbaker on Instagram! We LOVE seeing what you guys bake up. Cheers and happy cupcake eating! 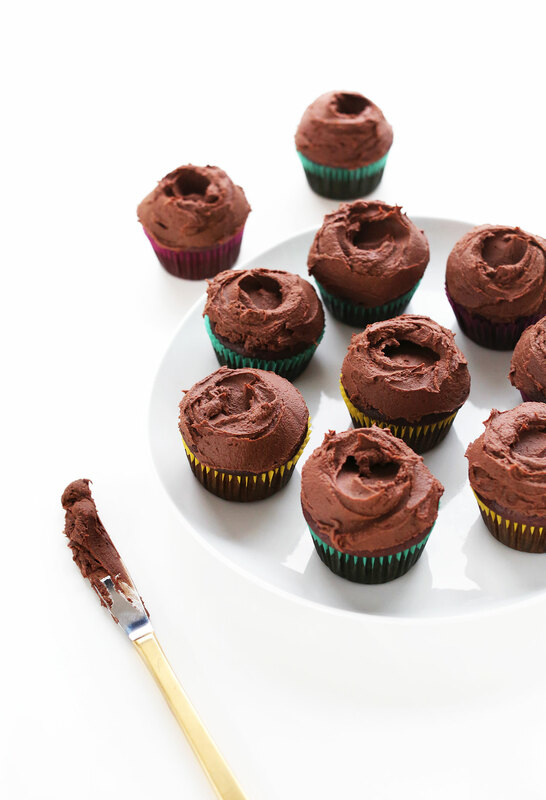 Amazing 1-bowl chocolate cupcakes that are undetectably vegan and gluten-free. Fudgy, moist, insanely chocolaty, and topped with sinful chocolate ganache frosting. FOR BEETS: To roast beets, preheat oven to 400 degrees F (204 C), drizzle 2 large beets (amount as original recipe is written // adjust if altering batch size) with oil of choice, and wrap in foil. Bake for 50 minutes - 1 hour or until a knife slides through easily. Peel away skins by rubbing foil around and it should shed off easily. Add beets to a food processor or blender and add 1/4 cup liquid of choice (I like a mix of water and orange juice // amount as original recipe is written // adjust if altering batch size). Blend until creamy, smooth and pourable, scraping down sides as needed. Otherwise, sub another fruit puree, such as applesauce, with varied results. 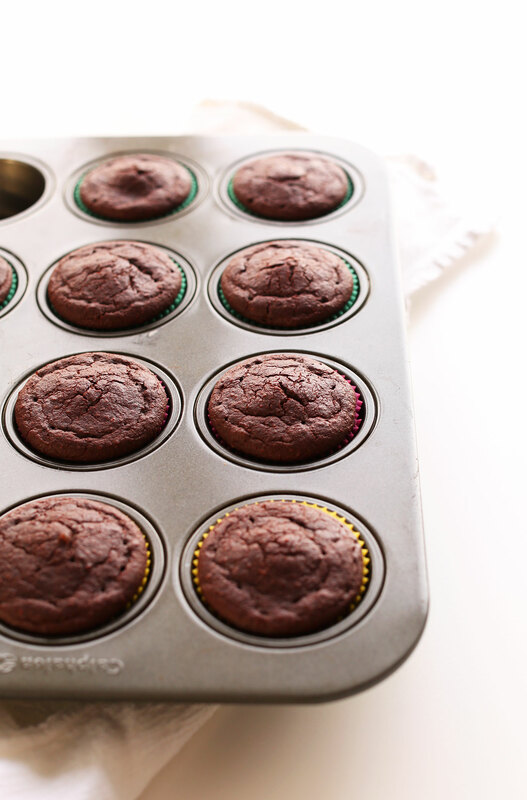 FOR CUPCAKES: Preheat oven to 375 degrees F (190 C) and line 11 muffins (amount as original recipe is written // adjust if altering batch size) with paper liners, or lightly grease. Also measure out almond milk and add vinegar. Stir and let curdle while moving onto the next step. Prepare flax eggs in a large mixing bowl and let rest for 5 minutes. Add baking soda to the almond milk vinegar mixture and stir. It should fizz. Add the sugar, maple syrup, and almond milk mixture to the flax egg and beat to combine. Then add beet puree, melted coconut oil, and salt and mix. Add cocoa powder, almond meal, oat flour, and gluten-free flour blend and beat to combine. If the batter appears too thick, add a touch more almond milk, but it should be perfect. If too thin, add a little more gluten-free flour blend + cocoa powder. It should resemble a thin batter that’s pourable. Divide batter evenly between muffin tins, filling 3/4 full. Bake for 29-34 minutes or until puffy and a toothpick inserted into the center comes out clean. Let rest in the tin for 10-15 minutes. Then remove and let cool COMPLETELY on a cooling rack. Don’t try to sample early because they need to fully cool or they tend to stick to the wrappers. Immediately add chocolate to warm milk but don’t touch for 2 minutes so it can melt. Stir with a wooden spoon to incorporate, then add softened butter and cover. Let rest untouched for another 10 minutes to meddle. 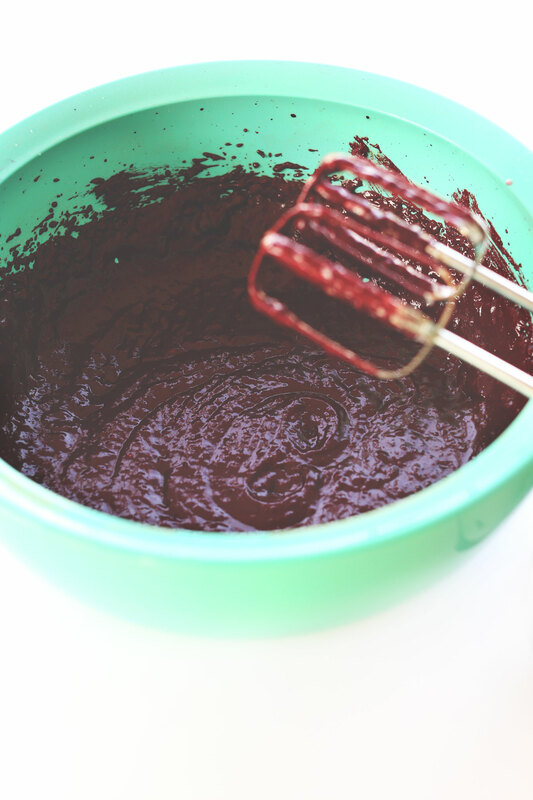 Use your mixer to beat the mixture together. Then add 1 cup powdered sugar (amount as original recipe is written // adjust if altering batch size), mix again, and place in fridge to set for 20-30 minutes. You’ll know it’s ready when you tip it and it’s slow to move. Remove from fridge and beat again. If it’s still too thin, add another 1/4 - 1/2 cup powdered sugar (amount as original recipe is written // adjust if altering batch size) and beat until light and fluffy. I found that chilling for a total of 20 minutes and adding 1 3/4 cups total powdered sugar was perfect (amount as original recipe is written // adjust if altering batch size). Frost cupcakes generously. You’ll likely have leftover frosting (unless you’re like me). Sprinkles, mint leaves, or fresh raspberries would make the perfect garnish. Will keep well-covered at room temperature for several days, though best when fresh. *I tried this recipe with both the Bob’s Red Mill Gluten-Free 1:1 Baking Blend and my go-to gluten-free blend and while both worked well, the Bob’s 1:1 blend yielded a narrowly superior cupcake. *Adapted from / inspired by my Vegan Double Chocolate Beet Muffins. *Nutrition information is a rough estimate calculated with a generous amount of frosting per cupcake. Hi Cyndi, we would recommend using a mix of oat flour, rolled oats and gluten free flour blend to compensate for the almond meal. For the almond meal, another non-dairy milk (such as rice milk). Here is our recipe for gluten-free Chocolate Cake. Hope that helps! I brought these to a party and they turned out delicious- moist and very chocolatey. One guest ate three. Can I possibly give this recipe 10 stars?!! No? Well it certainly deserves a 10 star rating! In short, these are AMAZING! I have very selective, very suspicious teenagers in my house, especially if they see me scouring the internet for recipes and then baking right afterwards (this site is always in my top 5 for recipes). If I am being honest, I am quite a lazy baker so I used organic canned beets which I rinsed and threw in my vitamix to make a sinfully smooth puree. I did not have oat flour on hand so I took just plain oats and threw them into my spice grinder to make my own oat flour, easy-peezy. And because I am a lazy baker I threw all this loveliness into a sprayed bundt pan instead of cupcakes. And….It. Was. FABULOUS! I did not even make the frosting b/c it was so lightly sweet and moist I didn’t feel like it even needed it, and now one at my house was the wiser! This is definitely a keeper! Thank you Minimalist Baker!! Hey dana! Are those freezer friendler? Would like to make them ahead! Oh wow! They just came out of the oven and they are soooo fluffy!!! YUM! I added a bit vanilla to it 😊 great recipe!!! … And i used ready cooked beets. Is there a reason that you roast them yourself? I found it much easier to used the ready cooked ones from the store…worked perfectly! Hi there. Do you have any suggestions for baking these at high altitude? I live at 8,000 feet and they all just sank in the middle. :( Thank you! Mine all sank too but we are not at high altitude. Made these tonight and finished 2 cupcakes straight off! For vegan and GF, they were moist, light, chocolatey and just what I needed! I used applesauce instead of beet puree (easier) and half/half of GF flour blend and almond flour to sub the oat flour. Added two more tablespoons of almond milk as it didn’t look wet enough, and got 12 large cupcakes from the mixture. Also made a lactose-free cream cheese frosting with just cream cheese and icing sugar, a nice balance for the sweetness of the cupcake. Super happy with how they turned out, and the rest have been frozen so I don’t eat them all at once! Thanks for the recipe, Dana .. looking forward to trying many more! Hi Juliana! A cake can sink for a couple reasons and this resource should help for next time! I’m wondering if there is a reason mine did not rise as much.l as yours did and what I need to add for next time. I still have. A lot of batter left so maybe I can add a little more but I know baking is more precise than that so just want to know for next time. Thank you! Hi Dana, I’m going to try making these for my 6 year old kindergarten class. I’m assuming but just want to be sure, there is no trace of beet flavoring whatsoever in the cupcakes, the beets really just add the moisture? Thanks! Wow! I admit, I was skeptical but these were amazing! I made these to take to the millions of birthday parties my kids have been invited to so they could have a fun treat to eat while their friends enjoy the regular cake. I tried one last night and they were delicious! If you did not know they were gluten-free and vegan, you would have no idea. My only question is – can I freeze the frosting? Thanks for a great recipe! Hi, I made these for my nephew’s wedding reception. There are many guests who are gluten-free and I wanted them vegan for myself. They were a huge hit. Though they clearly looked home-made everyone loved them over the regular pretty cupcakes. The homemade quality was on me, not the recipe. I used my go-to frosting recipe from the ultimate vegan chocolate cake. I was so pleased that many people at the reception had options. One woman came up to me and said that she doesn’t eat gluten and her daughter, a baby, doesn’t eat dairy. She was excited to enjoy a dessert and not risk an adverse reaction. My niece who made the “regular” cupcakes said many people told her how delicious the vegan gf cupcakes were and she had to say, through gritted teeth, that she did not make them! Thanks for your good work. Overall pretty good but the frosting was runny. I used Earth Balance and 2 c sugar. I had a little left over frosting and froze it and it never froze solid. The cakes had a slight bitter aftertaste. Would steamed beets work too? Or is roasting better? I made these cupcakes and infused them with a healthy version I found of Bavarian cream for our anniversary. They were delicious. We are already going to make them again and we found a Wilton tip 230 to infuse the Bavarian in the cupcake beautifully. Yum! That sounds delicious! Happy Anniversary, Lynda! Fun Saturday night activity: making these cupcakes! I love the beet purée the most. Do you have any suggestions for other uses of the beet purée? I ended up with 2 extra cups leftover bc the beets were gigantic. I guess I could throw it on my salads? I had just enough of all ingredients to double and a half the recipe, making about 34 cupcakes total. I used coconut sugar, a maple agave sweetener, vegan butter, and definitely used a fresh squeezed orange in the beet purée. Woo! Delicious although I’m still waiting for the final batch to cool from the oven. I’ll be frosting them tomorrow a.m. for the birthday boy. Thank you Dana! just pulled the cakes out of the oven!! I wanted to share that I followed the recipe to a tee, and put it in a 9 inch cake tin. Turned out brilliantly. I made 2, but instead of doubling the batter I just made 2 separate batters in two separate bowls. I LOVE the deep red batter mixture, was almost hoping it would stay that color, but it looks like a wonderful chocolatey cake (not so bad!). These are for a birthday cake, so I think I’ll wait until the day of the party to make the frosting. Hi! These are currently in the oven and am swooning over the super chocolatey smells! I don’t have powdered sugar, do you think I could use Coconut sugar in the frosting or will it be too granulated? Or maybe maple syrup? But worried it’ll be too runny. Any advice? THANK YOU!!!! And honestly, thank you for all these amazing recipes, I am obsessed. I have a vegan hubby and me and babes are gluten free, so win-win for us all! Hmm I would highly recommend using powdered sugar as coconut sugar would be too granulated, and maple syrup wouldn’t work. Sorry! Actually I ended up using maple syrup and then adding organic corn starch to dry out the frosting. It worked and all our non vegan/gf friends GOBBLED up the cake! I didn’t even get a chance to take a picture of it, it was devoured! Yay! Glad to hear that, Lidia! Hello! These look delicious and I would love to try them. Would a banana purée work as well? Yes that will work! Check the comments above as others have had success with this. I just made these yesterday, I subbed applesauce for the beets (because I had it on hand) and they were a HIT. Like SO moist and delicious and the icing was ridiculous. I love when people second look the “vegan” foods ? Absolutely delish!! Just finished making these and I got 14!! You rock Dana!! Hi! I have your cookbook and I’m looking to make your vanilla cupcakes for work. This recipe is relatively similar. I’m vegan, someone else is GF, AND another person is nut-free…any recommendations on substituting almond meal? Hi Sally! I would recommend using a mix of oat flour, rolled oats and gluten free flour blend to compensate for the almond meal! Can these be frozen? If so, can i decorate ahead of time and before freezing? I would recommend freezing the cupcakes without the frosting! They should keep for up to 2 or 3 weeks. I am allergic to flax; is there another vegan egg equivalent you recommend? I would really love to try these cupcakes! Hi Christie! How about a chia egg? Ok. I just served these for New Years. Fist time baking gf and I was very skeptical because the batter seemed pretty grainy going into the oven. But OH MY GOD these came out amazing. I made flax and almond meal, and oat flour by grinding in a coffee grinder. I added 1/4 cup peanut butter to the frosting. They were so moist and perfectly smooth even though they seemed a little rough going into baking. Thank you Dana, hit of the party!!! Hi! What could I substitute for the sugar in these? Thanks! Hi Rachyl! Try upping the amount of liquid sweetener (maple syrup or agave) and compensating the added liquid with a little extra cocoa powder and mix of the gluten free flours! Hope that helps!! I tried this recipe for the first time and I doubled it. It didn’t work! They didn’t cook in the middle and they sank. The texture was all wrong. Do you think I should not have doubled the beet purée? Liz, if I was making a double recipe I usually make up exact same recipe but in 2 separate bowls. As if I am doing 2 batches rather than a double batch. Not sure why this works better but it could be that some ingredients should not be doubled???? Hands down our favorite recipe, ever! We’ve been celebrating birthdays and holidays with these delightful cupcakes for a year now. Thanks so much! I made a practice batch of these a few days ago. My daughter’s birthday party is this weekend and I have a vegan+gf family coming and wanted to have cupcakes for them. I am not vegan but I am gluten and dairy free so it just about amounts to the same for baking. Here is my experience. 1) I used whole-ground flax seed. It didn’t seem to bond all that well, although it didn’t seem to make much difference in the final product. I may try a flaxseed that is not ‘whole’ ground. 2) This is the first time I’ve used Earth Balance and it seemed to work nicely. I don’t always love coconut oil for baking since it seems to work great for some things and not so much for others. 3) My mixture did not fiz when I added the baking soda to the milk and vinegar. Don’t know if that’s a problem or not. 4) I used applesauce because I didn’t want to go through the trouble with the beets. 5) I appreciated that grams were shown because I like using my scale for baking. However, the grams and the C measurements did not sync up for several of the ingredients, especially the cocoa powder. 60 grams of sifted cocoa powder was nearly 1 C, not 1/2. I went with the grams as much as I could to stay consistent. 6) I absolutely love your flour blend and I was surprised you recommended the Bob’s Red Mill but I went ahead and used that, it seemed to work great. 7) For the frosting: I used semi-sweet chocolate chips and am definitely going to try a bittersweet chocolate next time. The texture was great but the it was way too sweet and just tasted like chocolate chips. 8) Overall I thought the final product was quite good. The texture was moist and fluffy. Yes, I could tell they were not just regular cupcakes but they were enjoyable in and of themselves. I also found them more satisfying that regular. I could eat just one and be happy with that. I was very impressed they were g/d/e-free. 9) The cupcakes tasted even better on day 2. I kept the frosting separate and when it warmed up to room temperature the next day it tasted a lot better. 10) I took the cupcakes to a bible study to get opinions from non-food-allergy people and they all really liked them. Win! Final verdict: will definitely be making these again with just a couple of tweaks; mainly using a darker chocolate for the frosting. I would probably suggest double checking the grams vs. C measurements. How can I make this gluten free? Hi Diane! They are gluten-free! I made these cupcakes for my friend’s birthday and they were UNREAL! I made an accidental mistake though and did 3/4 c oat flour AND 3/4 c of 1:1, so after panicking, I mashed in half a banana and a bit more coconut milk (that was another substitution) and they were INSANE!!!! SO GOOD. For the frosting I used vegan becel and everyone at the party went wild for these cupcakes. Will be making again and again. Can you tell me what beet purée is? Do you mean beetroot ? Puree cooked beets in a food processor or blender until smooth. Amazing! I subbed more all purpose flour for the almond meal and they were still so moist, maybe a little more dense but still delicious. For the frosting I used coconut oil instead of vegan butter and it was perfect. Will be making these again! Followed the recipe to the letter (weights, not volumes) using the maple syrup and coconut oil options and I have to say that these were not my favorite. Putting it together wasn’t too awful. It was a little more work than a quick one-bowl non-vegan, non-gluten-free cake, but a whole lot less than a standard white or sponge cake. The taste was more or less fine. These are indeed not too sweet, which is good for something that’s getting frosted. Honestly, they didn’t taste like too much of anything beyond cocoa. The texture, however, was not terribly good. For me, vegan gluten-free cakes tend to fall into one of two categories: super dry or super wet. These were of the super wet variety. The texture got a lot better over the day that I let them sit out (which is pretty typical of vegan, gluten-free cakes), but the insides were still sticky, kind of like a dense, wet brioche. I tried cooking some longer (like WAY longer), but that just dried out the outsides: the insides stayed wet and weird. Still, this recipe wasn’t any worse than the typical vegan, gluten-free cake. The cupcake thing is the problem: when a cake comes out weird, I can usually fix it by splitting the layers thin enough and adding some ganache or vegan mousse between the layers. Cupcakes are kind of unforgiving, though, because you can’t futz around with the cake/filling ratio too much: you can core and fill them (which I ended up doing), but you can’t take out too much or those suckers aren’t going to be leaving the wrappers no way no how. Overall, I won’t make these again, but they weren’t the worst vegan, gluten-free cupcakes I’ve ever made: they’re just not what I’m looking for. Hi. Is there a way of getting around or substituting the oat flour? I know you can get gluten free certified oats but there is a protein in them that is so close to that in gluten that coeliacs like myself will still get the same reaction as eating gluten. Hi Kim! Instead of using oat flour just use the GF flour blend! What is best to replace GF ? I use a lot Chickpea Flour ? Or Almond Flour ? I made this as a sheet cake — I doubled the recipe and made an 11×7 cake and had extra batter for 6 cupcakes with plenty of frosting for both. The cake was seriously fudgy and delicious — whoa whoa whoa. I would recommend sifting the flours as well as the cocoa as my Bob’s Mills gf flour seemed to leave little bits that didn’t quite blend in. Also, I was a little short on beet puree and used some canned organic pumpkin I had on hand with no issues. I left the frosting in the fridge too long and it got too hard, and it never quite got the right consistency after that but it did taste wonderful! Thank you for a great recipe! I’m curious if you used Bobs GF 1:1 in blue bag or GF All Purpose in red bag? I have the All Purpose on hand & would like to make these!! Thanks! Hi, just wondering how to make the best purée? Hi Kayla! You can use all-purpose flour if you prefer! Check the comments for tips. Can this recipe be used to make a cake instead? Yes! Check the comments above! If I use spelt or AP flour – is it the same measurement as GF flour? I asked her what she wanted for her birthday this year, and she said, “those cupcakes you made for me with the beets”. So here I am, in the kitchen, reminiscing and licking every spoon. Thank you for making all our dietary restrictive dreams come true! Hi, These look perfect for my daughter’s birthday. Is the beet flavor strong? She is not a fan of beets. Hi Amy! You’re in luck because the beet flavor is not strong at all! I have to say that I was hesitant about making these, but so many of our family members now have modified what they eat, so I had to try them. There was only one person out of the seven people that tried them that did not care for them…my husband. But all the others, including myself, absolutely loved them. I have to tell you there was some these are so good dancing going on! 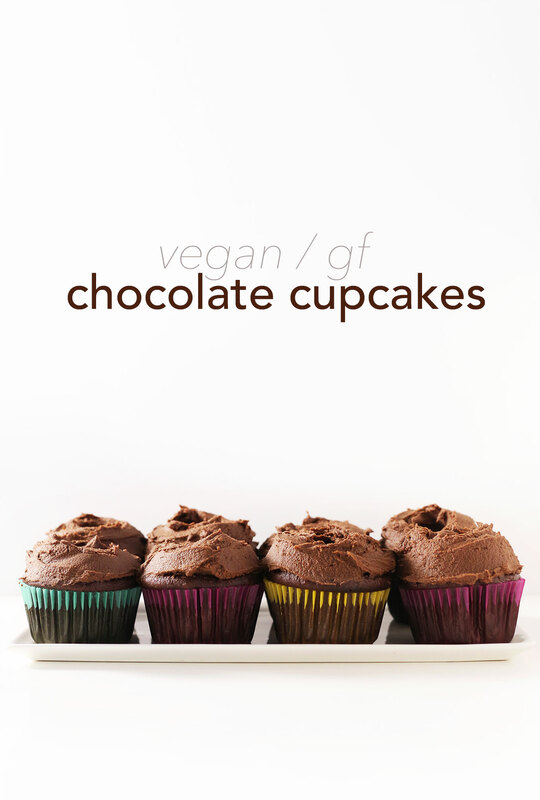 So, thank you for a great, healthy alternative to chocolate cupcakes. Can they be frozen? I have some extra beet puree…. I made these yesterday for a party. These are hands down THE BEST CHOCOLATE CUPCAKES I have ever eaten. Despite the fact that they are gluten free AND vegan! Thank you! These ended up gluey down the bottom for me. Any suggestions? Hmm, perhaps they were underbaked? I am new to gluten-free and vegan baking. Just curious why there is such a difference in baking time in comparison to regular cupcakes? I typically bake regular cupcakes for 18 minutes at 350°. Is there any way to fix a runny frosting? Cornstarch? Cornstarch or arrowroot starch will work! Add a little, mix and then add more as needed! What size cupcake wrappers should I buy to make 11 again? I forget. I’m making a slew of them for my daughter’s birthday party because she still raves about them from the few I made her last year! Hmm these ones used were just standard size, Heather! I made these cupcakes…..very delicious and moist! I am going to try making with apple sauce or canned pumpkin as the beets were a little time consuming ? The frosting was very good but mine was more of a thick glaze and I did use two cups of icing sugar? Maybe less liquid next time? Anyway thanks for the great recipe! Less liquid next time should do the trick, Sheila! I used mashed banana instead of beets and they turned out AMAZING! I took them out with just a bit of residue on the tooth pick to allow them to carry over cook in the hot tins, a method I would recommend to prevent the dreaded dry cupcake:) Topped them with peanut butter buttercream and my family gobbled them down! Very delicious! I didn’t have cupcake forms ,so decided to use the same batter but make brownies instead. Worked out perfectly! I replaced the sugar with dates and added some cranberries and desicated coconut. So I tried this recipe twice last night. :( Neither worked. I live in Australia and even ordered the 1:1 flour you recommended and the oat flour, from the States! Both batches were dense, and flopped when I took them out the oven. Looked all fluffy, but then sunk. The first batch I mixed with the hand mixer the whole time, and thought that was the problem. So the second time I mixed in the dry ingredients by hand. But same problem. Any tips or suggestions as to where I went wrong? My only – quite big – problem here is that I haven’t found any vegan butter options in Hungary so far. :( How should I make the frosting then?! I just made these and they’re cooling. I have a suggestion. When a recipe is pretty long, so that when you print it out the ingredients & quantities are on one page and the directions are on another, it would be really helpful to gave the quantity of the ingredient repeated in the directions. I found myself flipping from one page to the other constantly while making these – something I don’t usually encounter when using a recipe. Thanks, they smell delicious as they’re cooling – and I struggle finding a single recipe for a family of vegetarians, vegans and a GF! Especially a dessert – awesome! I have blanched almond flour, but not almond meal (which is more coarse). Can I use the almond flour or anything else instead? I was trying to avoid having to go to the grocery to buy yet another flour or meal. Excited to try this recipe. ….can maple syrup take the place of granulated sugar ? Hi! I am not totally sure as I have not tried it! If you give it a try, let me know how it goes! It’s a homerun! Recently found out my toddler is lactose-intolerant and I’ve tasted enough mediocre vegan cupcakes that I was eager to give this a go. You did it again Dana! 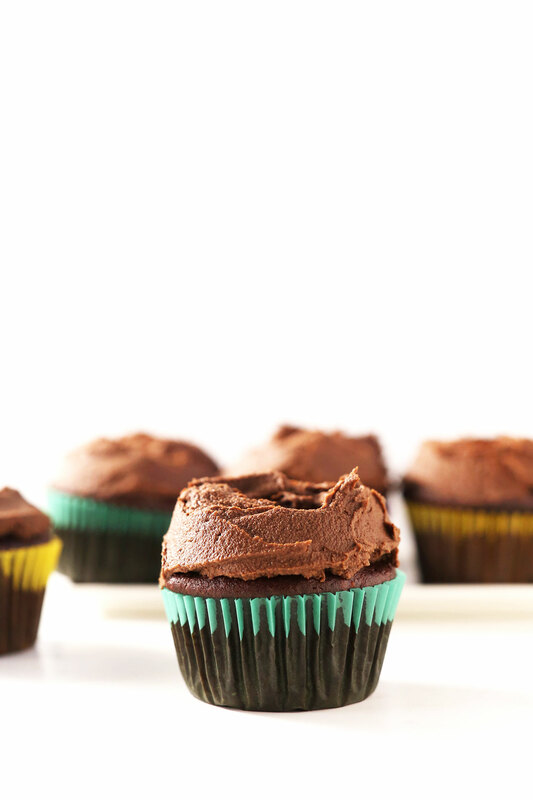 Chocolatey, flavourful, extremely moist and not as sweet as conventional cupcakes. I just made these as per your instructions and my husband and I can’t get enough. So grateful that those with food allergies can enjoy good food! Made these today and they are amazing!! Could I make those without the chocolate ie. to make them vanilla cupcakes? What should I put instead? I want to make those for my daughter’s first birthday but she cannot have chocolate or any caffeine as she has a rare heart condition… thanks!! Hi! Why not make these instead? Can I make these GF? We have lots of dietary restrictions here! Thanks! Hi Maude! You’re in luck – these already are GF! Happy baking! We made these tonight for a birthday dinner and they were awesome! So delicious and decadent. The only thing I would do differently is take them out earlier. I kept waiting for the toothpick to come out “clean” but it never happened, so I feel like they got a little bit dryer than they should have. But awesome recipe. We had them with the frosting plus a peanut butler drizzle from this recipe…and a selection of homemade dairy ice cream and coconut bliss salted caramel vegan ice cream. With PB drizzle on that too. UNREAL. I made these tonight, and they are so good! I used eggs instead of flax eggs, (because I could! ), and I didn’t roast the beets first (because I didn’t read the directions very carefully!). These cupcakes were spectacular and a huge hit with my gluten-eating family. 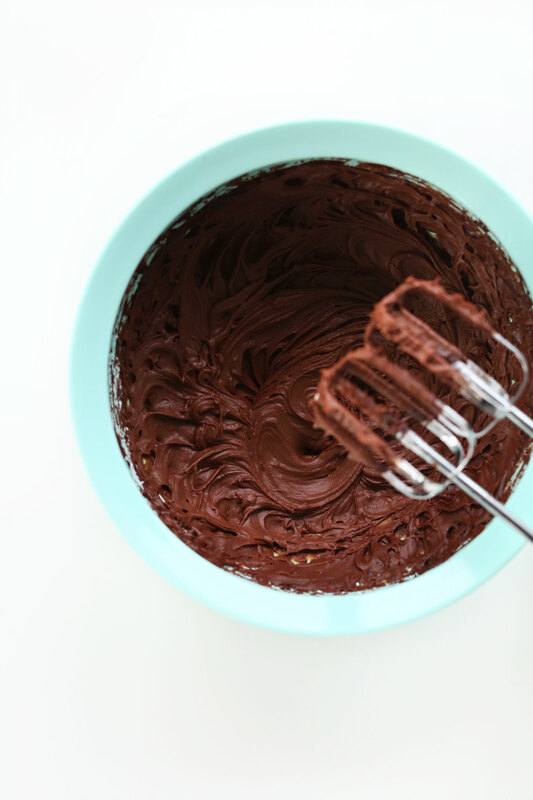 The chocolate ganache frosting is unreal. This recipe is a total keeper. Thanks! I made these for a gathering. My sister is gluten free and my friend’s kid can’t have dairy or eggs. They were amazing! Even my niece, who hates beets, helped me make these and was exclaiming how she couldn’t taste the beets at all. She usually prefers vanilla cupcakes, but ate two of these! could coconut butter take the place of coconut oil or earth balance? I haven’t tried that yet! But if you do, let me know! I made these and despite being an experienced baker and following the recipe exact, except I used whole wheat and coconut flour, my batter was extremely thick. I continued to add more almond milk but the batter seemed to absorb it as quickly as I put it in. Coconut flour is super, super absorbent. Maybe next time only use wheat flour, or the flours recommended in the original recipe. Just made these and they were perfect. I didn’t make them gluten free nor vegan (sorry!). Used two eggs to sub the flax and regular flour. I also used pre-cooked beets that come in a package. Also, I haven’t made the icing yet simply because I dont have any vegan butter and not sure what to use instead. Could I use coconut oil in the icing instead of the vegan butter? Thanks so much for sharing this recipe! Now that I’ve submitted a comment, I can get all 5 starts to show up. Is there any way to edit my first comment to fix the stars? I made this a couple of times last year, and am back to make them again! They are my favorite GF/Vegan chocolate cupcakes & frosting. The friends I serve these to have no idea they’re GF/Vegan and really don’t care, they only care about raving how delicious they are. 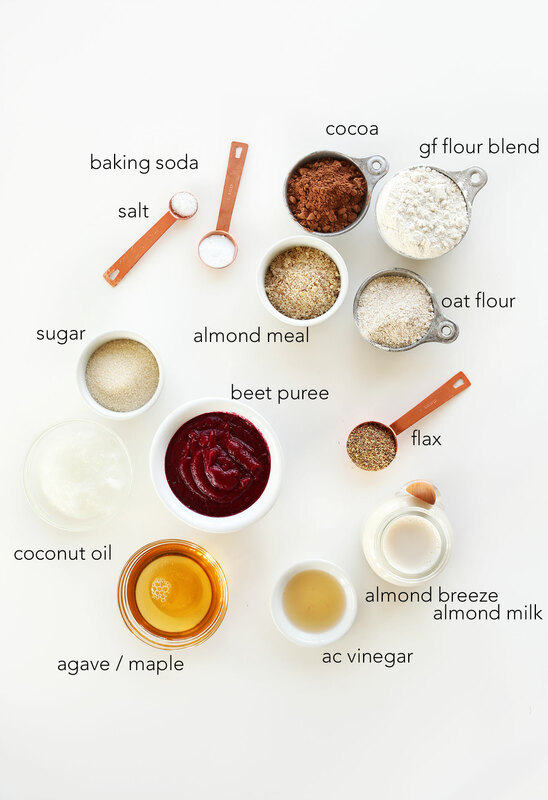 My ingredient options selections are: maple syrup, beet puree (from store-bought roasted beets), powdered egg replacer (instead of flax eggs), vegan butter and cacao powder (instead of cocoa). The cupcakes freeze well. I have some frosting frozen from last time; I haven’t defrosted it yet to try it out. Thank you so much for the recipes! Would coconut oil work in the frosting in lieu of the vegan butter? Thank you! And thanks for the quick reply, Dana! Can I use monk fruit powder instead of all sugars in the cupcake recipe? I have cancer but would love something other than greens. Hi Linda! We haven’t tried using monk fruit powder and can’t say for sure, but if you experiment with it, we’d love to hear how it turns out! Do you think this can be made in a 9×13 pan (as a sheet cake)? Perhaps it’s the type of liner you’re using? Feel free to spray them down with a non-stick spray or oil next time! I made these for a birthday party for one of the guests. She LOVED them. I did use a different frosting because she asked for vanilla, but otherwise – perfect. Making them again this week for my aunt who has many allergies. May need to substitute the almond milk but everything else should be fine. Thank you! Oh my goodness these were soooo good!! Just made them for my kids birthday party and they were a hit- everyone raved about them!! Thank you!! ?????? These are truly fantastic cupcakes! Mind blowing that they are both gluten free and vegan. So happy to have discovered the recipe for my daughter who is on a gluten, egg and dairy free diet right now. They were easy and absolutely delicious, and really elevated her spirit. I put just over 3/4 cups of beet puree and topped the rest up with strong decaf coffee. I used rice milk instead of almond, and while there was no big curdling action, it still resulted in a very moist, dense but light cake. We didn’t detect any negative flavours from the beets. I love that there was no weird baking powder taste so common in regular cupcakes. I used pecan meal instead of almonds. My daughter misread the recipe and used only 1 tbl of the maple syrup instead of 1/4 cup + 1 tbl and they didn’t suffer for it. A very forgiving recipe. Hi Dana! I was just wondering if there was any way I could make these without the almond meal (and what an adequate replacement replacement for almond meal in baking in general might be). Perhaps just more of one of the other flour-type things? My roommate is allergic to nuts, so trying to make things vegan and also nut-free often presents a challenge since so many vegan recipes contain almond meal. Thank you! Hi Samantha, how about substituting a seed meal, like finely ground sunflower seeds? Check out our Recipe FAQ for more information on substitutions! What the aquafaba were you thinking when you crafted this recipe? Would highly suggest subbing beets with applesauce unless you don’t mind a terrible, horrible, no good, very bad aftertaste. Also, almond meal looks like chicken feed. This recipe is so good. I didn’t have applesauce or beetroot so I substituted 1 mashed banana and half an avocado. Finished product was rich, fudgy, moist and decadent. No need for icing, actually Cheers. This will be my host special from now on. Hi, can I sub more oat flour or almond flour (or a mix) for the gluten-free flour blend? Every chocolate lover’s dream: delicious and healthy =) Thanks for sharing!!! For white cupcakes, could I just omit the cocoa or do I need to replace it with something? Thank you. Hi, the taste was good but they were not as moist, which is weird because the toothpick test failed and i took them out anyway. The definitely did not fluff up that much at all. I’d like to use these for a birthday party but I can’t figure out what I did wrong. I subbed wild raw honey for the maple syrup, but everything else was the same. I’ve just made it and WOW this is heaven in a bite! I was thinking “I’m not gonna like it, cause I hate beet’s flavour”, but it really surprised me in a very good way. There isn’t any beet flavour, it tastes amazing and the texture is perfect. Thank you so much for this recipe! I’m so gonna do it to my relatives. Your recipe will be famous here in Brazil! My family loved these!! Super simple to make and so moist and delicious!! I used applesauce as I didn’t have beets. I also only used Oat Flour because I didn’t have almonds to grind down nor GF flour. They came out better than I expected. I’ve used other recipes to make vegan vanilla cupcakes and used oat flour; while they came out good, they were kinda heavy. For some reason these weren’t. I can’t get over the moistness :) Going to make some tonight and bring them to work!! I made this recipe last night using apple sauce instead of the beet puree (1:1) and it worked perfectly. They are incredibly moist and delicious. The only thing is that next time i will likely add an extra couple tablespoons of sugar. I’ll just say it right here: yes, you should make these. You may be worried that the finished cakes will retain that earthy beet flavor, or that the frosting won’t have the right consistency, or that these are going to be some disappointing health-food rendition of the real deal. Wrong, wrong, wrong. These are an indulgent, rich, heaven-sent treat, and if you make them your only regret will be not making a double-batch once they’ve all disappeared after a few hours. HI! I’m not gluten free just love your recipes!! :) What is the almond meal for? Can I sub all purpose flour for all 3 of these-almond meal, gluten free oat flour, and gluten free flour blend? So 1 1/2 cups of all purpose flour? Or perhaps do 1 1/2 cups of the Bob’s Red Mill baking blend (I can find that at my grocery store)? Thanks for your help! Can you sub the potato starch for something? I really wanna give this golden unicorn a try!? Hmm, maybe a mix of the other flours? I made a batch last weekend and, as you are aware, they were amazing! I want to make them for my sister-in-law’s wedding and am wondering if I could get away with making a quadruple batch or if i t would be safer to do two double batches. I know things can get tricky when multiplying recipes. Hey there! I’m allergic to gluten and I tend to have a really bad reaction to oats even if it’s gluten free. I was wondering if you know if a good substitute for your recipes that call for oat flour? check out our Recipe FAQ! Theses cupcakes are amazing! So delicious! Love them! Thanks for the recipe! Would these be okay to make 2 nights before eating them for a bday party? How should I store them? Does the recipe work with buckwheat flour? Hey, I really want to try this recipe for my birthday next week and wanted to ask if all-purpose flour would work too? Hey there!! 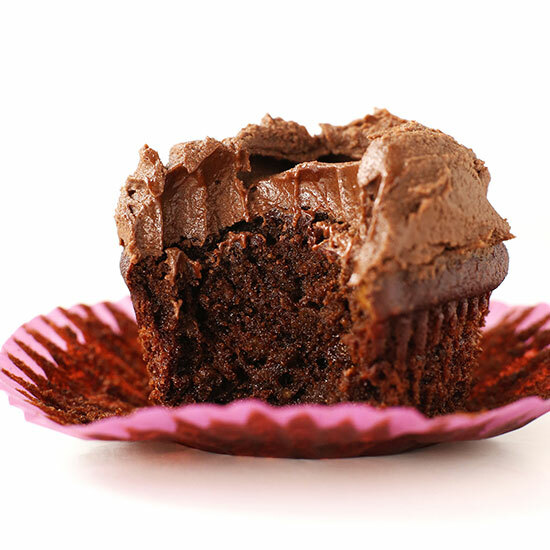 I am new to gf, so I was THRILLED when I found your chocolate cupcake recipe–Yay I love sweets! I made them and they were D-LISH, my son (the person who will only eat 5 things, three of which are pizza….and is suspicious of ANYTHING I make in the kitchen–I am known to hide veggies in just about anything I make. lol) ate one, gave me a thumbs up and then asked for another in his lunch for school!! WHAT?! That NEVER happens! So I am experimenting with them today. (why experiment with an good thing you may ask) Because they were so amazing and moist through the whole cupcake that they reminded me of somewhere between a Hostess cupcake and a hoho….So I am making them again today, but adding a marshmellow-y center (I am going to try adding before baking and then after to see which works out the best)! she’s loved them! gluten-free products I find are usually dry and crumbly as a majority but these little cakes were so fudgy, chocolatey and moorish I couldn’t believe it! she ate 4 of them during the night! :) we found that the beet puree was very prominent but lucky we like beets :) next time I may try apple puree. Also replaced the oat flour with buckwheat flour as she is coeliac and can not have oats and they worked a charm. We are going to try them with peanut butter frosting next time as per her request. I’m new to the gluten free thing but I was told not to eat oats because they have a similar makup to the gluten in barley, wheat and rye. So I’m just posting this for people making gluten free snacks for friends so they know this isn’t really gluten free for a very intolerant stomach. Dana did state in the recipe that she uses GF oat flour. automation. They rank the web pages that have the top search engine result and returns. can start doing this, without any educational qualification or industry experience. OMG! I am not a full 100% vegan, maybe vegan-lite, but I have friends with kids that have very strict dietary needs and I’m always scouring the internet with treats/snacks/foods that are yummy for everyone regardless of whether they have allergies or intolerances. I HAD to test these out for an upcoming birthday and WOW. So yummy. As someone who doesn’t really cook the vegan way the prep was a little different but that was ok. These were delicious and kid approved. Super moist melt in your mouth goodness. Kiddo wanted pink frosting so we used a generic buttercream recipe (vegan of course) and used some of the left over beet puree to color it. No red dye 40 here! They turned out super cute. Thanks for sharing! It’s a keeper! Oh dear! I must say, these cupcakes truly live up to their name! They are by far THE BEST vegan GF cupcakes I have ever eaten! AMAZING!!! I have many food allergies and have long been yearning for a cupcake that actually tastes good, and these by far exceeded my expectations. I nearly cried when I bit into one. Even my husband, who has no food allergies, could not stop eating them. I actually had to hide them from him, so I would have some for myself. :-) Thank you, thank you and THANK YOU! These look really good! But my Mom is allergic to beets and flax… Any advice on possible substitutes? Hi! First time visitor and I just wanted to say THANK YOU for the delicious recipe! My sister is gluten intolerant and is in town visiting, and when I had a chocolate cupcake craving I did some research and decided to give this one a try. We’ve tried tons of cupcake recipes over the years and I’ve never wanted to go back for more until these! Usually the flax seed smell is too strong or the cake is too hard and brittle. These were exactly as described – moist and delicious! The beet purée is genius! Thanks for the great recipe (I followed it exactly)!! Used applesauce, will try beets when I have more time. Loved every bite! Best cupcakes ever! * * * * * ! Hi Dana! I really like to use this recipe for a 9×13 cake for my daughters birthday! Would you suggest doubling the recipe? Maybe multiplying by 1.5. Good luck! Amanda, how did your 9×13 turn out? I need to make this as a cake and not cupcakes! Would you expect the same results using regular ol’ unbleached all purpose flour? I haven’t tried that, but it should work! Used regular flour and they turned out amazing. Huge hit! Everyone loved them! That frosting is darn delicious ? Thanks for the great recipe! I’ll be trying more of your creations! These are great! Super fluffy and moist!!! I used the gf flour mix, but instead of white rice flour, I used garbanzo been flour and instead of potato starch flour, I used arrow root starch flour. I used Apple sauce, honey, coconut oil and coconut sugar. Instead of cupcakes, I used an 8×8 cake tin. Instead of this icing, I wanted to avoid processed sugar so I opted for a date icing instead and it turned out unbelievable… My kids could not stop asking for more and they said they wanted this cake for their birthday cake. might be a silly question but… is this considered raw diet material? my brother is a vegan. and does a raw diet. it’s his brother next week, and the rest of my family doesn’t bother to participate in his food choices. i do though. i want to make him these cupcakes for his birthday, however i am not sure if baked goods, such as above, is considered raw still. I know its too late but no this isnt raw. If it is cooked it is not considered raw. Sorry! I made these last night for valentines day! I finished 9:30pm and I could not wait to taste it, I tried it as soon as I woke up. These are so good a wholesome. Thank you so much for a vegan cupcake recipe I can make! These are yummy :) the best gluten free vegan recipe I have tried. Thank You. Goid evening, I would like to makes these for my son’s bday party. Would it be OK to sub the oat flour for rolled oats? Thank you. I used all purpose flour instead of the other flours. They came out more dense rather than fluffy like a traditional cupcake. Could that be because of the all purpose flour? I would guess so. I haven’t tried these with all purpose. Sorry about that! Is there any way I could use non gluten free flours? Am not a big fan of flour and always finding options to substitutes. Is there anything that can be substituted for flour/GF blend? I made them yesterday for my work farewell and they are just genius!!! I had to add more almond milk as the batter was quite dry (my gluten free four blend), but that is not an issue at all!! These are the best cupcakes I have ever eaten, EVER. I used soy milk and substituted garbanzo flour for almond. Also I don’t eat powdered sugar, so I used a two ingredient frosting made with coconut cream and dark chocolate chips instead of this frosting. Superb. I added a few dark chocolate chips to the cupcake recipe also. So good. I can’t wait to try this recipe. Do you think I could substitute the all purpose flour with Bobs Red Mill gluten free 1 to 1 baking flour instead? Made these tonight for my birthday – they turned out well! Didn’t have beets so used apple sauce instead. The apple sauce added some extra sweetness, so I think in the future I would use a little less syrup if using apple sauce again. I do want to try these with beet puree though! First time I have used your recipes, and just wanted to say how amazing this turned out! I have a severe dairy allergy/gluten intolerance, and this also works perfectly for orthodox fasting requirements! I did alter the ingredients to use coconut milk instead of almond, and coconut flour instead of oat flour, and as aptly named by yourself they turned out to be the best cupcakes ever. I made these today and wow! So good! I actually made your cream cheese frosting instead of the ganache because I wanted to add a bit of the beet purée to make it pink and they turned out perfect. You can’t taste the beets at all and they’re so cute. Thanks! These are horrible. Don’t attempt, or else you’ll regret it, but the icing is good. Thanks, Dana. Really love your site and how willing you are to help those of us with super-allergic kiddos. I need to make this recipe both NUT free and tree nut free. As in, NO COCONUT. Can someone please post the EXACT proportions of how to SUBSTITUTE gluten-free oat flour and oats for the almond meal? Hmm, if I were you I’d sub the entire amount of almond meal and oat flour with gf flour blend! Hi! Is there anyway to make this recipe just gluten free? Maybe by using eggs? Regular milk? Can you help?!! Hi I’ve made a few recipes by you so far and loved them! I have a cousin who is gluten free and these will be used for Christmas his year owever would I be able to use 2 regular eggs in replace of flax eggs and whole milk instead of almond? Any thoughts on using aquafaba instead of flaxseed eggs? These look great! I’m gathering ingredients to make these for Christmas. I was wondering what I should look for in the way of unsweetened coco powder ? In my area there only seems to be Fry’s coco or possibly Hershey’s. Also I have flax seeds, can these be used in some way for the flax eggs or should I track down some flax meal ? Fantastic recipe. I’ve had people try these and not even know they were gluten free or vegan, which is pretty impressive. I use unsweetened applesauce instead of the beet puree – it’s easier in a pinch. :) Thanks for the great recipe – it’s the best I have found! I bake for a living, but I am new to the gluten free world – a lot of things that need to be re-learned. OMG, these are INSANELY good! I couldn’t wait to make them and didn’t have any beets so used pumpkin puree instead … ground up oats and almonds to make my own almond meal/oat flour … it worked brilliantly!! These are my family’s new must-have cupcakes for any celebrations, thank you!! Is there a reason you use almond milk instead of coconut milk? I’d assume coconut milk is richer and this would lead to a richer cupcake? Can you use avocado to substitute the beets? I saw someone use it in another vegan cupcake recipe and have amazing results. Have you tried using avocado to substitute for eggs? I would actually not sub avocado – maybe applesauce? Beet is still best. Also, light coconut milk should be fine! I made these for a trivia night event but since I didn’t have beets, I swapped for avocado and they look amazing! I also added cream cheese to the frosting cause I couldn’t get it to thicken enough with just sugar. I suspect it’s because I used regular butter. I also swapped the flax egg for chia egg. I hope they taste as good as they look!! Mine obviously are not vegan but that’s ok ? Thanks for the recipe!! Thank you Dana, for these amazing, oh so delicious cupcakes. I have been gluten free, dairy free and egg free for several years now and have tried countless recipes. So many of them have been really disappointing. These are hands down the best I have ever made. They are rich, moist and decadent. I took them to a family gathering where I received rave reviews from all. Thanks Mishara! I agree, they’re the best! How many eggs do I sub for the flax eggs? 1 small chicken egg per 1 flax egg! These cupcakes are so amazing that I have to leave a comment here. We recently found out our baby girl is allergic to wheat and eggs which makes baking very challenging. Luckily, I found your site and made these cupcakes for my daughter’s first year birthday party. They turned out to be moist, perfectly sweet and taste just like, well, delicious chocolate cupcakes! Thank you for sharing the recipe. I also started making a few more of your recipes including tonight’s samosa potato cakes. My vegetarian husband was really happy. :) Thanks again for that! Looking forward to trying out more recipes! Can I sub pumpkin puree in place of beet puree for fall? I just answered my own question! Made there tonight and they were amazing! Thank you! I made them last night too! Glad you enjoyed them, Michelle! Made these tonight and they were amazing! Thank you! hey Nancy, so did you use Apple sauce as a sub to beets? and they didn’t go very well? I live in turkey, Istanbul, and there is no vegan butter or margarin in this country! How can i replace it? I would love to make cupcake frosting. I am already doing the chocolate because there is no vegan chocolate too. We do have coconut milk and oil and coconut cream, almond milk and soy cream, but one brand that can not be whipped. Try replacing it with coconut oil, like in this recipe! Sounds like a wonderful recipe. Would it work if I use 100% white rice flour and that’s all I have? Hi, thank you for this wonderful recipe. My daughter’ s bday is coming up, will this come out as good if I bake into 2 cake rounds? And how long to bake for? Thanks for any help. Yes! Use this recipe as a guide. It’s very similar. I am not intolerent to gluten. What can I use instead of the gluten free flour? I prefer using whole meal flours instead of just white flour, Can you please sugguest? I wanted to ask the same thing. I do not eat gluten free either and dont have the Ingredients to make it, just ww pastry flour. I’m not sure how to do the substitutions. Please advise. Thank you!! I can’t have almond meal, so what should I use instead. And could I use soy instead of the almond milk? Wow! Yum! I used fresh smashed figs from the tree in the garden :) DELICIOUS!! I also paired it with raspberries and put whole pecans on top for decoration. Best ever graduation cake. Thank you!!! My son is allergic to everything! I really want to make these for his bday, but he is allergic to peanuts and tree nuts as well as dairy, eggs, soy, and wheat. Is I use hemp milk for liquid but is there something I can substitute for the almond meal? LOL never mind I see the person above me tweaked it already. I should have read every comment! These cupcakes are the PERFECT sweet treat for my daughters’ birthday party. They have friends and grandparents that are vegan, gluten-free and allergic to nuts and soy. I used coconut milk instead of almond milk and I used 1/4c more oat flour and 1/4c flax seed meal to replace the almond meal. They were scrumptious and my husband couldn’t even tell that they were vegan or gluten-free. Thanks again for a GREAT recipe! *I used all Trader Joe’s ingredients (including their gf flour blend) and it all worked out great. Have you ever made a batter the night before and cooked it the next morning? My dad (a baker) used to do this all the time, but never with vegan recipes. I only ask as I’m not sure how the flax with react sitting for 12+ hours (I don’t want my batter to become like “chia pudding” by letting it sit overnight). Oh well, I will attempt prepping tonight and baking off tomorrow! How did prepping the night before go? I’m curious because I want to do this recipe for my daughters birthday and that would help a ton! Hi! I am making these today for my husband’s birthday (our son is gluten-free & casein free so I am super excited about this recipe!) but I just realized I only have 1/2 cup of GF all purpose flour left and I don’t have any starch component to make a little more of my own. Any idea what I could use for that extra 1/4 cup of all-purpose flour? I’ve got brown rice flour, white rice flour, oat flour, coconut flour & almond meal. Thank you! I’m so excited to try so more of your recipes – your pizza crust is our favorite!! Ok, these were hands down the best cupcakes I (we) have ever had. I made these with 2 real eggs instead of flax, and they came out perfect. I just made these last night, and they are delicious!! I love to cook, but I am pretty clueless when it comes to baking. I was kind of intimidated by all of these ingredients, but it was completely worth it. It really is the best cupcake I’ve ever had! It’s super moist, and not too sweet. I had a few friends test them, and they also gave raving reviews! The only issue I had was with the frosting. I followed the instructions but on the light side of the sugar (1 cup). I left it in the refrigerator all day and the frosting still wouldn’t fully harden. I think next time I’ll use more sugar and less almond milk? Overall, I’m really happy with my experience and am excited to make these again! So wonderful! Thanks for sharing, Lisa. So wonderful – thanks for sharing, Lisa! I have a question on the measurements: when I measured the half cup almond meal and cocoa, my half cup was filled at 45g, not 59 or 60. Any one have this issue? I kind of split the difference and it turned out really good and moist so I guess it doesn’t really matter but I’d like to do it “right” for the next time. Because there will be a next time. Hi Dana, I know someone has asked something similar already, but I’m making these for a friend who has an almond allergy, so could i use coconut milk instead and hazelnut flour for these instead of the almond? Would the hazelnut flour work just as well as the almond meal? Sorry, also a substitute for Oat Flour, as she is also allergic to that. could i use a mixture of Rice or Coconut Flour instead? Yes, I think that should work! Or sub almond milk for rice milk. Let me know how it goes! What about coconut flour? I saw some yesterday & wondered if I can use this in place of the almond meal? No allergies…I just like to have options! I just made a batch of these. I followed the recipe, only subbed the beet purée for applesauce and for the oat flour I used brown rice flour, once they went into the oven they just spread out and flattened out the party pans. Would this be because I didn’t use a cupcake pan to put my patty pans in? They just went straight onto a flat tray and in the oven. So weird! The brown rice flour might’ve had an effect. I’m not sure..I haven’t heard of anyone having this issue. I don’t know what a patty pan is…perhaps that was the issue! These were amazing! I am on a dairy, soy, egg, and gluten free diet due to allergies in my breastfed daughter, so I was looking forward to trying this recipe. I’ll admit to being sceptical about how good these would be, but they really are great. And not just “this is good for a vegan/GF cupcake.” These actually might be the best chocolate cupcakes I have ever made. I didn’t have beets, so I used a mix of carrots and sweet potato instead, and I used a little extra almond meal and GF flour in place of the oat flour. Thanks for the recipe! Ooh! Great modification. ..I’ll keep that in mind! I am a high school student and an avid baker. mini-cupcakes being my favorite to make because I can get more from one batch so I can share more with my friends at school. I also go to an art school and so we definitely have quite a few people who’s diets fall under vegan, gluten free, or both (I don’t know why, but I’d never met a vegan at my old school). The texture of these cupcakes are fantastic, the flavor, not so much. I’d advise adding 1-1 1/2 teaspoons of vanilla extract to the batter, it helps a lot, still not perfect, but better. mine turned out mushy :( going to try again tomorrow. I think i did to much flax in it. I am thrilled to find this recipe!! My daughter is GF, dairy free, and nut free! I would love to stick a batch in the freezer so I can pull one out for birthday parties, etc. Have you tried freezing the cupcakes? Just wondering how they will be! Thanks! I usually freeze without frosting. I haven’t! But I think it would be fine for up to 2 or 3 weeks. And yes, I’d freeze without frosting. Oh wow! These were absolutely the best cupcakes I have ever eaten. Even better than the ridiculously expensive ones I have bought at posh NY bakeries. I made these for my daughter’s birthday and impressed the hats off even my non GF vegan guests. Thank you so much for this perfection of confection. Making more today for Mother’s day. High compliment! Thanks for sharing, Jodi! Hi Dana! I wanted to make this recipe for a coworker that is only vegan. Would you be able to recommend a sub for all 3 flours to save on cost? I think you could sub all of those for all purpose. Hi, I was wondering if you would let me share your cupcake recipe with folks that I am selling cupcake liners to. I would like the recipe with the beet mash on a format that I can print on a letter sized sheet and include it with the order – it can include your web address. Oh my goodness, thank you SO MUCH. I have been gluten free for years but became vegan pretty recently, and I was so nervous going into it. A lot of people called me crazy (“What are you going to eat?”), and I felt like a kind of loner- I had no idea where to go for new recipes for my old favorites. I didn’t even bother with the internet as a resource because I somehow convinced myself that no crazy person would want to go gf/vegan. So this post helped me so much, not only for the recipe (though those cupcakes look AMAZING), but to find a similar community. Thank you so, so much! And good luck with future recipes- I’m cheering you on! Hi Dana, I’m wondering if this recipe would work in a 9×13 and if so I would bake it for how long? Hmm, I think it would! Check it at 20-25, then go from there! And be sure to grease your pan well. Has anyone tried this recipe with an addition of some vanilla extract? Or do you think it would be less yummy? I can’t wait to try these for a bake sale!! Sorry to be a bother, but can we sub the sugar with dates? I don’t have a problem with gluten, so can we use regular flour instead? Can we sub the oil and vegan butter with something else? I’m not sure as I haven’t tried them! But let me know if you experiment! These are fantastic!!!! I’ve had to go gluten and dairy free in the last 6 months and have been CRAVING chocolate cupcakes since (there have been actual tears in the grocery store involved!). No more tears!!!!! These are just what I’ve been dreaming about. I used applesauce instead of beets and half almond half gf flour instead of oat flour because of availability and they were just fabulous. Thanks so much for your awesomeness! 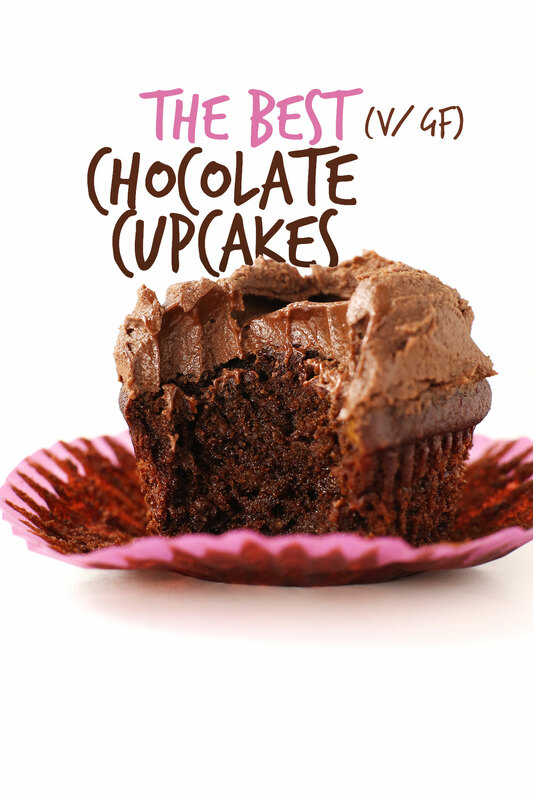 I made these last night and the cupcakes were moist and chewy–but I could sure taste the beet! We also had to add some extra sugar otherwise the contrast in sweetness between the cake and the icing was pretty extreme. It was a fun test though–thanks for the recipe. These look great! I am wondering if coconut sugar may work instead? Also, on the recipe it just says 3/4 for GF flour. I assume that is 3/4 cup..? Yes! that’s what I meant. 3/4 cup. Also, on the coconut sugar I’m not sure because I didn’t try it and it can react weird in baking. But check the comments as I believe some other people may have tried it with success! In any case, check back to let me know if it works out! This is mega late, but I always use coconut palm sugar, or dates/date sugar, or figs in place of cane sugar. For some reason cane sugar makes me ill. Coconut flour can act like a sponge if you’re not careful, but coconut palm sugar has never given me an issue. I used it this morning for the cupcakes, and the results were great (thanks Dana!!)! My boyfriend, who claims to not eat cupcakes, kept begging for more. If you’re iffy on the whole coconut versus cane, here’s a good rule of thumb: recipes that are on the dryer side to begin with shouldn’t be used for coconut subbing. Otherwise, go for it and see what happens. In this case, these cupcakes were built to be moist. Happy binging! Made these cupcakes! SOOOO SOOO good! Thanks for this recipe! The first gluten-free vegan cupcake recipe I’ve ever tried, and they were delicious! I substituted chia seeds for the flax seeds because my son is allergic and they still turned out beautifully. I only needed 1 cup of powdered sugar for the frosting. One question: 1 tbsp of chia seeds weighed 9 g at my house. I went ahead and used 2 tbsp chia and 5 tbsp water total anyway. The cupcakes turned out, but just for clarification, are chia seeds heavier than flax seeds or is that a misprint? Thanks for sharing Suzan! So glad you enjoyed them. Chia seeds may be heavier than flax seed. I would almost guess since they’re a bit more dense. In any case, thanks for sharing your results! Can I use eggs instead of the flax eggs? Thanks! Yes! Anywhere I say “1 flax egg” substitute 1 small egg. Good luck! Yes! In place of any flax egg sub 1 small egg. Let me know how it goes! Hi Dana, this recipe looks great! Do you think it would turn out as well using store bought already steamed beets (the ones that are vacuum packed) to save time, or do you feel strongly about using roasted beets rather than steamed? Thanks for the help, can’t wait to try these! I think so! Also, you could try unsweetened applesauce for a similar result! Did you try using the steamed beets? I was wondering if pureeing a can of preserved beets would work too. I can’t wait to try them, but I was wondering if I can substitute the glutenfree flour for normal all propuse flour? You should be able to though I haven’t tried it myself. Let me know how it goes if you decide to give it a try! 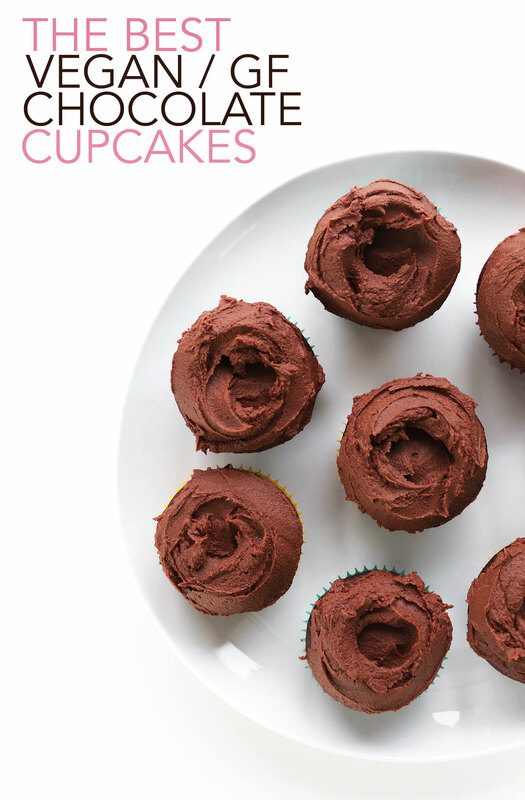 These look amazing, though I have one question–would it be detrimental to the cupcakes if I were to use regular all purpose flour rather than a gluten free flour blend? I don’t have any gluten free flower on hand, but would love to make these bad boys! That should work! Let me know how it goes, Kelly :D Just be sure not to overmix because all purpose is more sensitive (with the gluten) than GF blends. The only reason that I tried these cupcakes was that I needed a vegan and gluten free recipe for a bake sale. I had zero expectations that they would be good. I followed the recipe exactly as written (except for the frosting) and the cupcakes were surprisingly good. The texture was great, very moist and tender. I had leftover beets and a craving for these vegan gluten free cupcakes today. I made this recipe again, adding melted chocolate to the cupcake mixture and I’m in love. They were perfect! Will be making this again. Never thought that I would like much less love a vegan gluten free recipe considering how much I LOVE butter. How much melted chocolate did you add? Did you change anything else? I’m curious to try these for my dad’s birthday for non vegan non gluten free eaters…and need some advice, thank you. My boyfriend’s birthday is coming up and he recently had to go gluten free … I’d make him the happiest man alive if I could make these Peanut Butter and Chocolate Gluten Free Cupcakes … In your quick opinion, how could I do?!?!?! Sorry for the delayed response! I’d suggest adding peanut butter to the batter (maybe 1/3 cup and cutting back on the beets by 1/3). Also, drizzle some peanut butter on top of the ganache and top it with a dairy-free PB cup!! I am usually lazy in the dessert department – give a dark chocolate bar and I am a happy camper. However, now that I have found this recipe, I think I will have to buy a muffin tin. Love the idea of adding beets. Made these today as mini cupcakes (baked 17 minutes, and a half recipe yielded 24 minis). I used all purpose flour instead of the gluten free mix. These were amazing, and you can’t taste beets at all. Best frosting ever, and super moist cupcakes – thank you! Scrumptious! Love the addition of beets. I’ve never really baked with them before but need to give them a try! Ooh, you must! I think you’d love the texture/moisture they add! I love your site. I cook/bake many things from it. My daughters birthday is this weekend and I’d like to make these. We’re not gluten sensitive so what would the ratios be if I wanted to use the almond meal, oat flour and regular flour. Should I then use white or whole wheat? Hi Anna! If possible, just swap the GF flour for all purpose and still use oat flour and almond meal. Otherwise, I’d recommend subbing all the flours for all purpose. I haven’t tried the recipe this way, so proceed with caution! Let me know if you give it a try! IF I didn’t care about these being vegan, could I use real eggs in the cake mixture and butter in the frosting and they’d still work just as good? These look amazing and I’m making them this weekend. Thanks so much! Yep! Totally. Sub 1 small to medium egg per flax egg. Good luck! My kid is allergic to flax, what can I use to sub the flax eggs? I made these today, and they are wonderful! Just as you described….very moist! My husband and I were very happy. I will be sharing on facebook! Thank you for the great, healthy recipe! I made a double batch of these last night (but with a choc/ avocado ganache instead of the frosting because of the powdered sugar) and I just needed to let you know that never in the entire year of my plant-based, gluten and refined sugar free diet have I tasted anything so heavenly, so devine. I didn’t think I would ever be able to enjoy a ‘real’ cupcake again but you’ve made that possible. You are a baking genius- thank you! Oh my days, these look delicious!!! I was vegan for 2.5 years but I still eat mostly plant-based, so these will be a great addition to my usual recipes. Beet puree? Interesting. I’m always intrigued when beets are in baked goods. I’ll have to try this! Sorry, tried to comment from my phone, and it went nuts. Well I’m nuts, NUTS ABOUT THESE CUPCAKES! Just made them this morning as a Valentine’s treat for my boyfriend. He’s gluten and lactose intolerant, and allergic to red meat. So your blog has literally been a life saver! I will say I cheated on this recipe and used 2 real eggs because we’re not vegan. But they turned out delicious!!!! I will post pictures to my instagram and be sure to tag Minimalist Baker! Thank you thank you thank you!!!!! So great! Thanks for sharing!!! Thank you, looks amazing. Was wondering if there is anyway to cut on the powder sugar in the frosting may be add some dates since you use dates a lot but not avocado ( am allergic ). ookay I just finished baking them (and eating one! )… and… oh my.. it’s perfection. As a chocolate homemade cakes lover, and newly vegan, I just found out another reason to stop using animal product, so THANK YOU SO MUCH, it’s AWESOME! Oh so cool! Glad we have French readers ;D So glad you liked them! The BEST BEST cupcakes I’ve ever had (not even mentioning the Vegan/GF). I used 100% sugar/soy free chocolate for the ganache and it was delicious. I also replaced the sugar in the cupcake with monk fruit sugar and substituted icing sugar with Swerve zero cal sweetener. The results were incredible. I highly recommend this recipe… But be prepared to eat like 3 of them …at least!!! Great! Thanks for sharing, Delia! Yeah! I’d say either just drizzle peanut butter on top of the frosting OR add in 1/4 cup peanut butter to the frosting! haha, yes! So glad you enjoyed them!